The return capsule of the Shenzhou 8 spacecraft parachuted to a safe landing in Inner Mongolia on Thursday, wrapping up China's first docking mission ahead of manned flights next year. No astronauts were aboard the capsule, which touched down at about 1130 GMT (6:30 a.m. EST) in China's Inner Mongolia autonomous region. Views of landing were broadcast on Chinese state-run television. Landing occurred at 7:30 p.m. Beijing time. It was after nightfall in the touchdown zone in the Central Asia steppes. 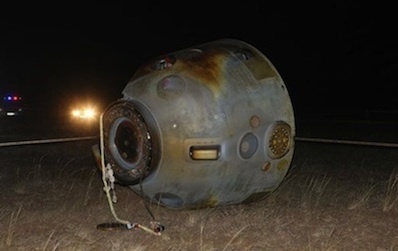 Recovery crews reached the capsule a few minutes later to begin recovering experiments and assess the craft's status after almost 17 days in space. Chinese Gen. Chang Wanquan, commander of China's manned space program, announced the successful return at the Beijing Aerospace Control Center. The human space office is managed by the People's Liberation Army. The Shenzhou 8 mission achieved China's first automated docking with the Tiangong 1 module, a prototype for future components of a Chinese space station. Shenzhou 8 docked twice with Tiangong, first at night Nov. 2, then a daylight link-up Nov. 14. The spacecraft departed Tiangong 1 on Wednesday, then fired its thrusters for a de-orbit burn less than an hour before landing. Covered in a heat shield to survive the fiery plunge back to Earth, the re-entry capsule separated from the Shenzhou's habitation section and propulsion module before encountering the upper fringes of the atmosphere. Tiangong 1 remains in orbit to receive two more Shenzhou spacecraft next year. At least one of the missions will carry a crew, according to Chinese officials. Shenzhou 8 launched Oct. 31 from the Jiuquan space base on a Long March 2F booster.